This is how Carl Nielsen starts his boyhood memories, which came out in 1927 under the title “Min fynske Barndom” (My Childhood on Funen). This autobiography is our main source of information concerning Nielsen’s childhood and youth until he left Funen at New Year 1883/84 in order to study in Copenhagen. 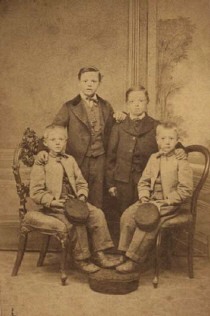 The brothers (from left) Carl, Peter, Sophus and Anders Nielsen har their picture taken ca. 1872. The house in Sortelung (= the Black Bog) where Carl Nielsen was born disappeared long ago. No new building has replaced it; but where it used to stand there is today a memorial slab and a flagpole. Carl was born as the seventh of twelve children. His parents were Maren Kirstine Jørgensen, née Johansen (1833-1897) and Niels Jørgensen (1835-1915). All the children bore the surname Nielsen (patronymic after their father Niels). This was contrary to the decree concerning the fixing of family names issued in 1856 by the newly established Ministry of Church Affairs. But many priests, especially in the countryside, still allowed the traditional use of patronymics for the greater part of another generation. Niels Jørgensen worked as a labourer on the neighbouring farms and a painter, too. He was therefore generally called by the name of Painter-Niels, even when he went around playing at dances. He was often away for several days on end and at such times Carl’s mother, Maren Kristine, was alone in charge of the household. On one occasion she was left alone with this responsibility for a longer period, as Painter-Niels was conscripted from December 1863 to August 1864 due to the war with Prussia and Austria. Carl Nielsen’s earliest musical memories related to his mother. It was his mother who handed him the three-quarter size violin hanging on the wall when, as a six-year-old, he had the measles. He then taught himself a few melodies, which he played for his father when he came home. His father listened silently, took the violin, tuned it and handed it back to his son (this is the only glimpse of a music-teaching scene between father and son that posterity has been allowed!). “I was not very good at bookish subjects, but not one of the worst either. 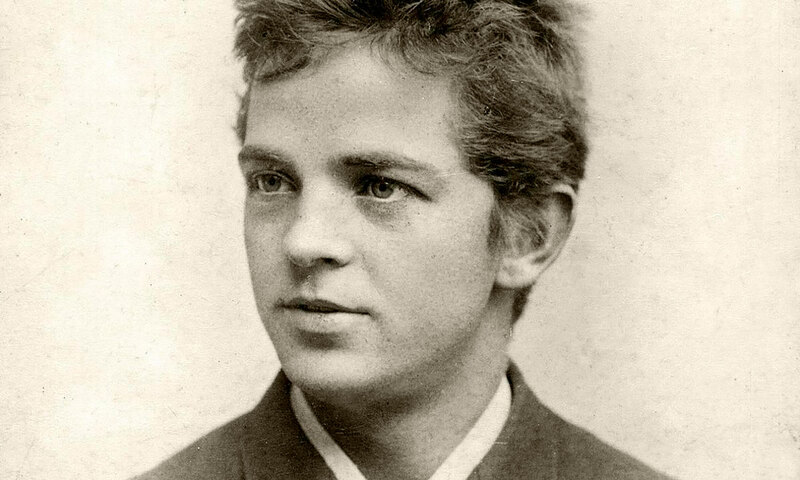 On the other hand I could jump quite high at gym, and I was particularly good at climbing ropes and bars: I could climb up and down several times in a row without using my legs.” This is how Carl Nielsen describes his encounter with school in “Min fynske Barndom”. Young Carl is believed to have started school on 1 May 1872. He was lucky in that a new assistant teacher, Emil Petersen, was appointed the following year. He got the school up to standard again after a period of decline. “He was a gifted man and I am very thankful to him, also because he taught me later on to play the violin properly from notation.” Carl soon went out to play at dances with his father. He also started composing small tunes, which he noted down as best he could. Like other labourers’ children, Carl Nielsen had to do varying amounts of paid work from an early age. His earnings were part of the family income; yet the children were usually allowed to keep a small amount for themselves. Carl went out to work for the first time when he was eight or nine years old as a goose-herd at Bramstrup Hall. As he grew older he was able to do increasingly challenging work. Thus, one summer, he came to be employed at a nearby tile-works. It is not quite clear when exactly Carl Nielsen’s family moved to another house called Petersborg, situated on the parish boundary between Nørre Lyndelse and Nørre Søby. The lease is dated 23 March 1879, but there is good evidence that they had already been living there for a year by that date. Nowadays the house, which is known as “Barndomshjemmet” (Niel­sen’s “Childhood Home”), has been made into a museum. It has been moved a few yards to the west due to the resiting of a road.